"I create Thalnok to My Court / So that I may observe my son / by faithful, foolish proxy / Listen — The last true shape depends on, asks for, venerates nothing." Thalnok, Fanatic of Crota is a Hive Knight that appears as a boss in the Court of Oryx. Like Crota, Thalnok can only be killed using a sword that appears in the middle of the arena. Thalnok attempted to impersonate Crota in order to gain favor with Oryx, the Taken King. Amused, Oryx played along and raised him to the Court of Oryx as a proxy for his absent son. Thalnok is reminiscent of Crota in terms of both appearance and battle techniques. He wields a gigantic Cleaver that is able to kill any Guardians in one hit, so keep your distance. He will also summon both Hive and Taken throughout the fight and support them by pelting Darkness Blasts from afar. There will be a sword-bearing Knight named Hagrist, Blade's Edge, who must be killed in order to pick up the sword relic. In order to attack him with the sword, Thalnok's shield must be broken down, which will take quite a bit of firepower to do, but once it happens, he will fall to his knees, allowing the Guardian who picked up the sword to rush in and slash him until either his shield recharges or he is killed. Multiple sword runs may be required to defeat Thalnok. 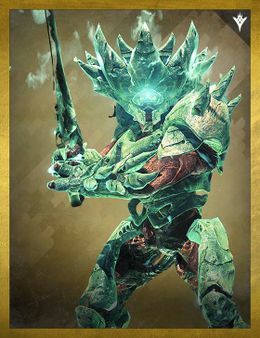 Thalnok is the only character in the Taken King expansion to have a title that points out Crota. Oryx points out Crota as being his biological son, but it does not say so in his title.